Festivals, new breweries, a confederacy of hunches…. Like the essential product, the business of brewing is a fluid situation. Brews and breweries come and go, ownerships move around like chess pieces, but for the imbibing public, it’s usually what’s in the glass that counts. And at festivals, there are plenty of chances to fill glasses with different products. The seventh Brattleboro Brewers Festival begins at noon on Saturday, May 26, running to 4 pm in a single session at the Vermont Agricultural Business Education Center on Old Guilford Road. As of this writing* there were still some Early Bird tickets available online for $25; tickets at the gate are $30, cash only, but keep in mind they sold out last year. 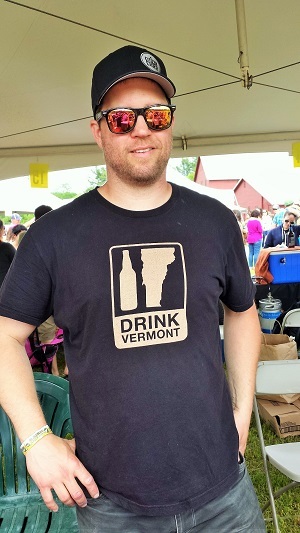 Further down the line, if up the road, is the Vermont Brewers Festival in Burlington, in four sessions on July 20-21, the 26th anniversary of the much-larger event. 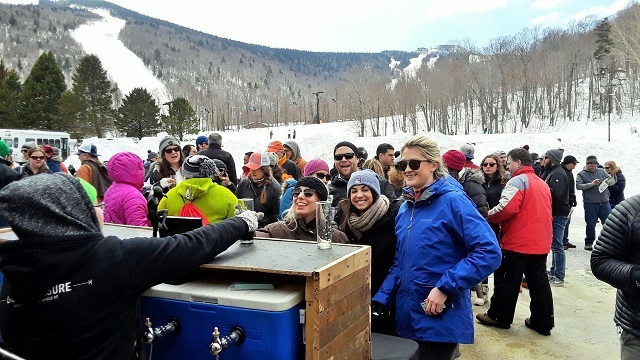 In the immediate rear view mirror, the Vermont Brewers Association also held its first outdoor winter festival on March 24 at the Killington Resort, breathtakingly situated right at the base of the K1 lodge as a busy day of skiing went on at the mountain above. There are probably as many reasons to attend beer festivals as there are beers served. Revisiting old favorites certainly counts, but my goal is usually to try something I haven’t had before. The winter festival offered that up in plenitude. 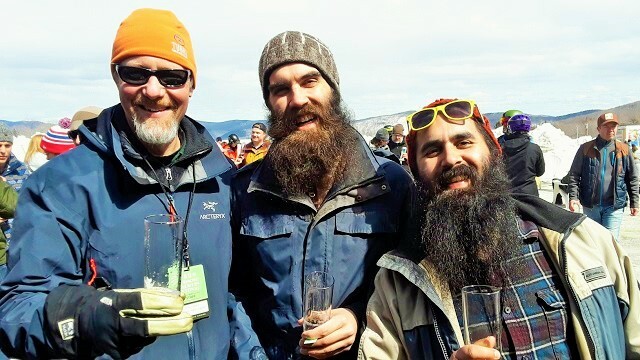 With 32 breweries under four tents pouring samples of well over 100 beers in two sessions (the second one sold out), there wasn’t a prayer of trying everything. Experimentation was the working theme of the winter festival. Whether recipes are hunches or the result of scientific calculation, the brewers went all in on offering collaboration beers, about 30 in all. I barely moved from the tent where Brattleboro’s Hermit Thrush was pouring, since they appeared to be the collaborative champion, offering beers made in cahoots with Simple Roots Brewing, Drop-in Brewing, Trout River Brewing, 14th Star Brewing, and its Brattleboro neighbor, Whetstone Station. Kelli Corbeil, general manager of WTSA radio station, which organizes the festival, noted several first-time brewery appearances this year, including The Alchemist, of Heady Topper fame. Expect some long lines at that booth this year. Brown’s Brewing of Troy and North Hoosick, New York will rock a fruit theme, with a 4.75% Guava Gose and the aptly named Cherry Razz, a 6.5% amber ale made with cherries and raspberries. Wormtown Brewery of Massachusetts is a new entry for the festival, but it may become a more familiar name when it opens a taproom in Keene, New Hampshire. Now in its eighth year of operation, the Worcester brewery underwent some ownership changes last year, resulting in expanded distribution throughout Massachusetts, some into Rhode Island, and generating the plans to open the taproom on Winchester Street in Keene, though that probably won’t happen until 2019. 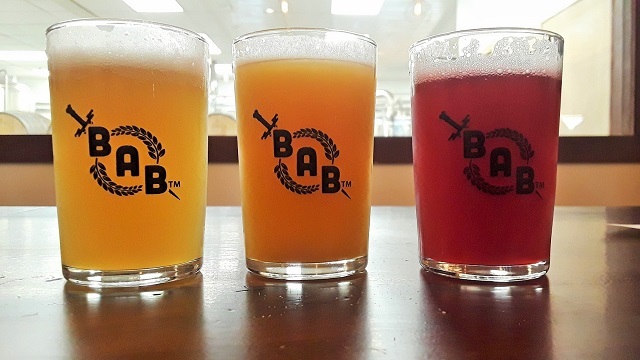 Even more action in Keene will unfold on Saturday, May 5, when Branch and Blade Brewing officially opens its doors at 17 Bradco Street, the grand opening beginning at 11am. Partners in the startup, Trevor Bonnette and Jesse O’Bryan, are twenty-somethings who met on a college rugby pitch. They’ll be serving up some intriguingly named beers—a peach gose (“Here Gose Nother Paycheck”), a chocolate stout (“Hands in the Cookie Jar”) and an oatmeal coffee brown ale (“Waking Up in Handcuffs”)—and will subsequently also make a debut appearance at the Brattleboro festival. Beer isn’t the only impetus to attend the BBF: for a $5 ticket a designated driver can enjoy music from the band Blues for Breakfast, food from a few different vendors, games, a scavenger hunt and three different divisions for the Keg Toss contest—men, women, and old geezers.